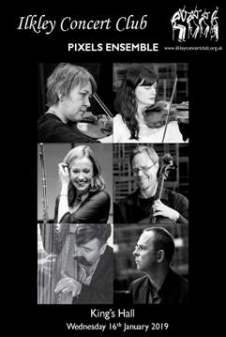 Pixels Ensemble is a collective of established chamber music players with a shared passion for performing the finest repertoire from the classical period to the present day. 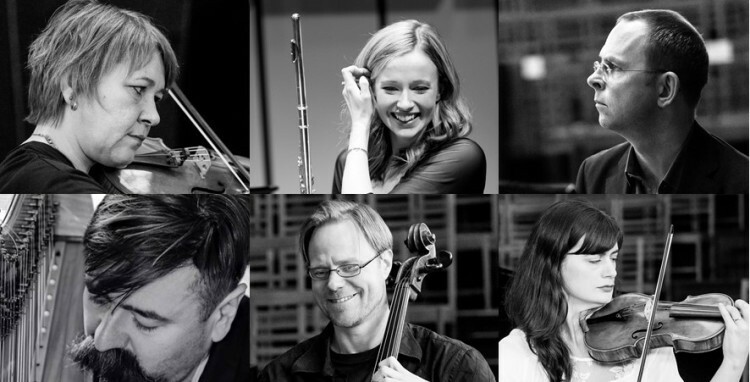 Vastly versatile, this group appears in a wide range of combinations and line-ups For Ilkley, Pixels will comprise a sextet of flautist, harpist and pianist with a string trio. Their programme is built round the three sonatas, of a projected six, which Debussy completed before his death in 1918 and which, like Ravel’s Tombeau de Couperin, were intended to commemorate both those killed in the World War and evoke the French composers of the eighteenth century. The combination of flute and harp is taken up in the quintet by Jean Françaix full of his characteristic wit and charm. In addition we will hear the first of Mozart’s delightful flute quartets (K285) as well as the first ever piano quartet (K458), a financial failure because it was too difficult for amateurs! Pixels Ensemble are a group of instrumentalists who get together in a variety of combinations to enjoy making chamber music. For this concert, Ilkley welcomed a pianist, a string trio and Fiona Fulton (flute) and Hugh Webb (harp) to perform an intriguing programme combining Debussy’s last three sonatas with quartets by Mozart. These final sonatas which Debussy wrote in 1915 are as remarkable in their way as Beethoven’s last quartets. You get the same feeling that a new kind of music is struggling to be born. In the cello sonata, both piano and cello (the excellent Jonathan Aasgaard) are more percussive than lyrical although short stretches of melody arise unbidden from their angry exchanges. The violin sonata in contrast is the more obviously virtuoso work: Sophia Rosa gave a dazzling performance with beautiful tone, lightness of touch where called for and dizzying facility in the madcap runs and trills of the final movement. In both these works, Ian Buckle was a perfect partner conjuring an amazing variety of tonal colours from the piano. Forerunner of a whole repertoire, the sonata for flute viola and harp, is perhaps the most approachably French of the three, with its delightful minuet, but it too creates a new sound world of strange harmonies with the flute and viola (Vicci Wardman) eerily echoing each other, sometimes lyrical and sometimes savage, and the harp binding all together. In the first half we also heard Mozart’s first flute quartet – the most beautiful tribute to an instrument which Mozart reportedly could not bear! This showcased the brilliant flute technique of Fiona Fulton, whose sweet light-toned playing made the most of the lyrical Adagio as well as the nimbler passages in the Rondeau finale. The second half started with the Françaix quintet, as ever with this composer both witty and well-made, and finished with Mozart’s first piano quartet, a piano concerto in all but name, emphasising the skills of sympathetic partnership of these talented musicians. For the first time we have a review in the on-line Yorkshire Times at http://yorkshiretimes.co.uk/arts#Pixels-Ensemble-Ilkley-Concert-Club-Kings-Hall-Ilkley. Elaine Annable gave a positive review, ending with ‘this was a most entertaining evening, and I’ll certainly be making a return visit to the Ilkley Concert Club‘. A recently issued CD from Harmonia Mundi, at full price (HMM 902303), has superb performances in excellent sound of all three of tonight’s works. Isabelle Faust (violin) and Alexander Melnikov (piano), together with their friends are the performers, and this is, without doubt, one of the best Debussy CDs of his anniversary year. A Chandos disc (CHAN 10932), at full price, is my first choice, with Lisa Friend (flute) and the Brodsky Quartet performing all four Flute Quartets. An alternative, at medium price, is a very satisfactory Naxos CD (8.550438), where all the Flute Quartets are performed by Jean Claude Gerard (flute) with the Ensemble Villa Musica. The work is available on a well performed Naxos disc (8.570444), at medium price, entitled “French Flute Chamber Music”, performed by the Mirage Quintet. The other composers are Tournier, Schmitt, Pierné and Roussel. Paul Lewis (piano) and the Leopold String Trio perform both Quartets on a well recorded Hyperion CD (CDA 30011) at full price. A good alternative, at medium price, performed by the Menuhin Festival Piano Quartet, again containing both Quartets, is on Naxos 8.554274.